A few quilt tops. I think the theme this weekend was "random". 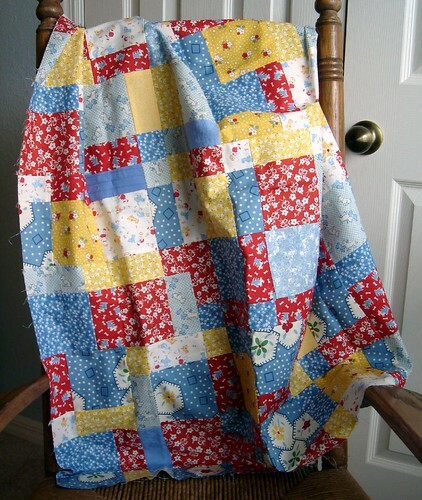 For the most part the pieces in these quilts were laid out randomly, which made for a fun laid-back time with them! I'd be working on them now but the new sewing machine is not working ... I'm not happy, in fact I'm pretty ticked off. I have to drop it off tomorrow and won't have it back for a week or so. Not happy. The last charm pack of April Cornell Sunshine. The back will be bright yellow and the binding will be blue. The kids went through the small scraps bags and cut the pieces into 2.5" strips, whatever they handed me was what I sewed, following this method. The brown piece 5 rows up is an oops though ... it was actually part of the binding for a different quilt that got too close to the scrap pile ... of course it's the last of that fabric so now I'll have to come up with a completely different binding for that quilt ... oh well! Part of an Amy Butler charm pack, alternated with white flannel left over from the girls quilts. The binding and back will also be Amy Butler, I believe. 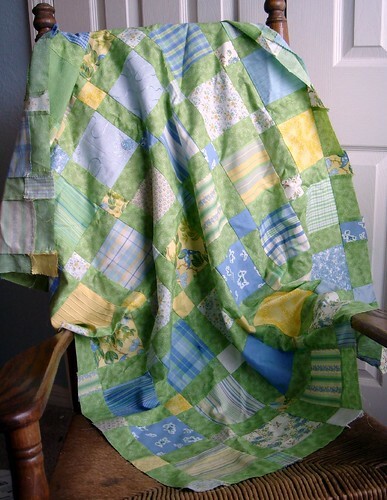 Very random disappearing nine-patch quilt top, I love this one! The binding is going to be blue with a little bit of flowers and the back is yellow butterflies. Oh you were so busy, I love all the new tops you whipped up from charm packs, that's what I should do too, butI got many new bolts today,so I had other priorities. hope your sewing machines gets cured in a breeze. Love love love the Amy Butler!! You've been busy and WHAT?! the new machine is broken? Horrible. 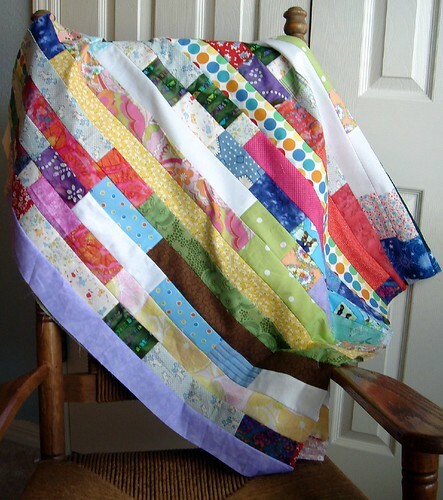 I particularly love the middle two quilts - the Amy Butler charm pack is gorgeous. Hope your sewing machine gets better soon! Wow, I love them all! My favorite is the blue, green and yellow one. But too cute about your kids helping you put together the scrap one! Here's wishing your machine a speedy recovery! Ooh love the brightly colored one. It looks like candy! They are all very creative. I hope your machine gets better! I noticed all the lovely stitching you can do with it in previous posts. 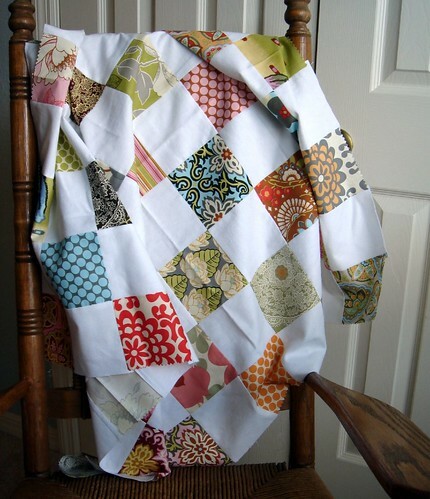 Guess I'm echoing everyone by saying I love the Amy Butler quilt - the white just makes the colors pop! You've been busy! Bummer about the machine - hope it gets fixed quick! I love the strip one! I mean, i love them all, but that is the one that jingles my change the most! I just started a flickr group for all Free Spirit and Rowan fabrics, I hope you will add whatever you have to the pool! I am in love with the last one, the blue, yellow, and red one. It makes me smile... wow you have been really busy lately.